This is a short note, folks, just to show what Simon & Schuster are doing with the covers for the new titles. 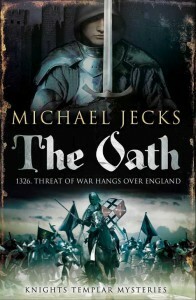 The first title from Simon & Schuster, number 29 in the series, will be called THE OATH, and I reckon that the jacket tells pretty much what the book is going to be like. What do you lot think? Been a busy week, but worthwhile. I’ve managed to get the basics sorted with Conway Stewart for a pen, to be called the Michael Jecks, oddly enough. It’s going to be a limited edition pen, a “Winston” in Conway Stewart’s Dartmoor resin, a really lovely dark colour, with gold bands and nib. Very attractive. I’ve also agreed some other interesting projects with them, I’ve mostly completed an introduction to a new series, and now I’ve got a picture for the book to be published in May – and I’ve figured out a whole chunk of book 30 too! Which is good because next week I have two days in London, and a third on 24th, when I’ve a bunch of meetings with my new publishers. A busy time – but fun! Let me know what you think of the book cover! This entry was posted on Friday, March 12th, 2010 at 4:11 pm	and is filed under Dartmoor. You can follow any responses to this entry through the RSS 2.0 feed. You can leave a response, or trackback from your own site.